The College Community celebrated the founding of the College in 1904 on Thursday, October 18, with a special Founder’s Day Mass in Holy Family Chapel. Focusing on a message of hope, faith and love during his homily, Father Joseph Flynn, chaplain, spoke of the College’s foundress, Mother Irene Gill. “I believe Irene Gill had a sense of hope when she founded the College because she knew the needs that existed for young women at the turn of the century and she opened CNR so that women could be credentialed and become teachers and accepted and recognized for the value that they were. 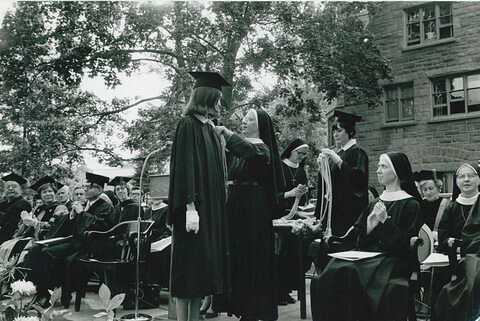 Founded by the Ursulines in 1904 as the first Catholic college for women in New York State, CNR grew to include the Graduate School in 1969, School of New Resources in 1972 and the School of Nursing & Healthcare Professions in 1976. In the more than 114 years that have passed since its founding, more than 50,000 women and men have been graduated from CNR and have gone on to make a difference in society. Today fully coeducational, with a student body of 3,000 across four schools and five campuses, the CNR continues to advance forward ever faithful to the mission set forth by Mother Irene Gill more than a century ago.